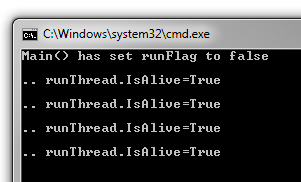 The background thread should run until the runFlag variable gets set to false. We start the background thread and then set the flag to false on the main thread. But running this code in Release|x86 mode, it turns out that the loop never exits, even though we set runFlag to false. This is caused by a compiler optimization related to our runFlag variable. Could you be more explicit please ? What would be the solution ? Good question–answer coming up in tomorrow’s post. Also some explanation as to what’s going on. If you want to read ahead, go do some googling on “volatile” keyword in C#.